Brown, Caroline Elizabeth Bradford, 1949-? 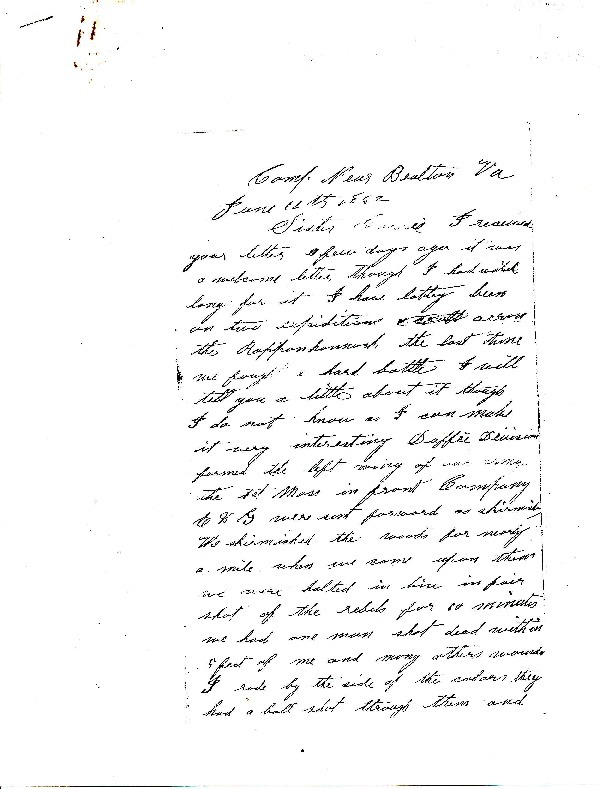 Photocopy of a 5-page handwritten letter from Elias Bradford of the 1st Mass. Cavalry, Co. E, to his younger sister, Caroline Bradford, describing a recent cavalry action along the Rappahannock River. The letter includes personal anecdotes of fellow soldiers and camp life. The year of the letter is in question; it appears as 1862, but this may be due to quality of the photocopy. War records indicate Bradford had not yet enlisted, in 1862, and the events he is describing most likely took place in June of 1864. Gift of Dwight Clary, Conway, Mass. Bradford, Elias Ford (1837-1913), “Elias Ford Bradford to Caroline Elizabeth Bradford, June 12, 1864,” Conway Historical Society, accessed April 21, 2019, http://conwaymasshistory.org/items/show/794.